Western culture is steeped in Christian art. Modern musical notation was developed in the Catholic Church. Michelangelo worked directly for the pope. For centuries, most of our culture’s greatest art was commissioned by the church. Symbols, subjects, styles, aesthetics and much more that came out of the ecclesiastical tradition are still very much part of our culture. 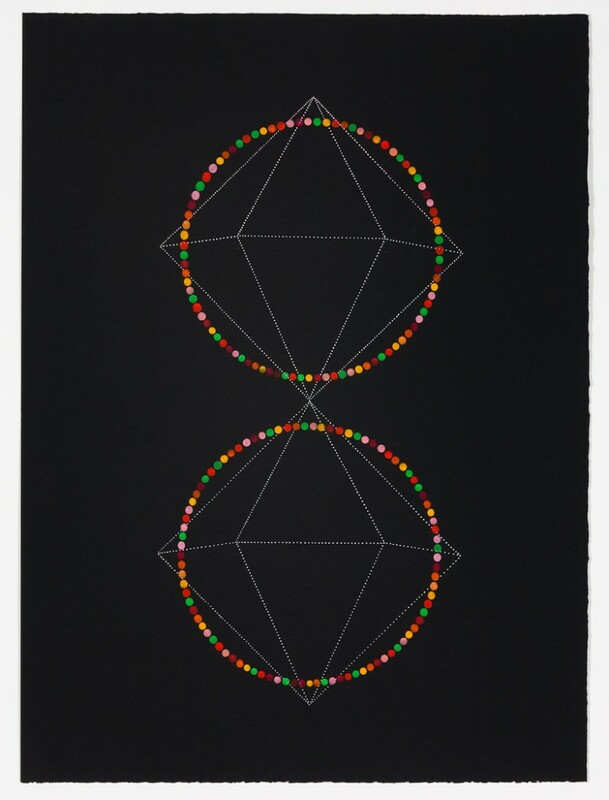 In a statement about her exhibition “Indigo” that just opened on Good Friday at Aucocisco, Grace DeGennaro notes her interest in sacred geometry and traditional symbols led to a body of work focused on diamonds, concentric circles and, specifically, the “vesica piscis” shape. The vesica piscis (literally “fish bladder”) is a pointed ellipsis made by intersecting two circles of the same size. It is one of the early (and still common) Christian symbols that has been equated with the idea of the spiritual container, chalice, vessel or grail. To identify each other, history has it that Christians would draw half an arc in the dirt in hopes that the stranger would draw the other half to make a fish using the vesica piscis form. This fish is an active symbol for Christians — we see it everywhere. DeGennaro’s works are painted in oil on indigo backgrounds that represent the night sky. They feature geometrical forms rendered through dots and a few wispy, solid forms. She sands down the indigo surfaces to reveal underlying colors (often visible on the edge of the canvases). This effect makes it look like stars in the night sky, but also gives the works a historically venerable feel. 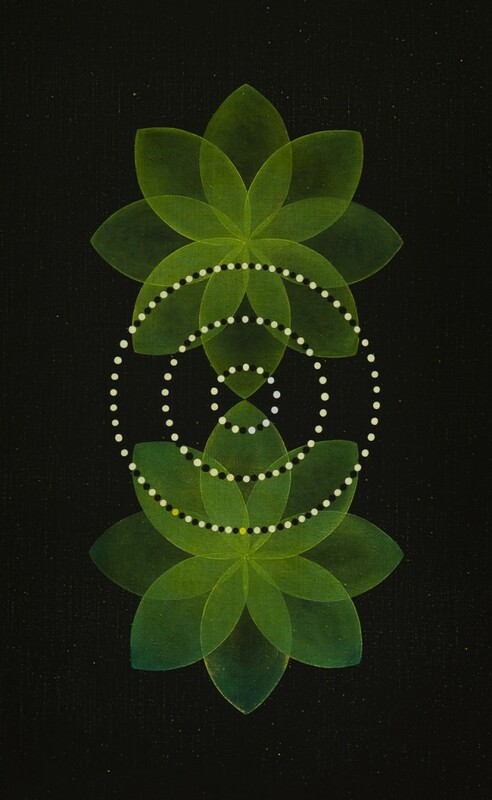 On Easter, it makes sense to talk about the vesica piscis in Christian terms, but it is likely that a viewer walking into the show might not even notice the shape in DeGennaro’s paintings, because they are mostly used in lotus-like groups of eight. With their insistent symmetry and circular forms, the first impression of DeGennaro’s paintings is their visual proximity to Buddhist and Hindu mandalas. DeGennaro’s paintings can be used as objects for spiritual meditation, but they work just fine as very handsome abstract paintings. You don’t have to be interested in mysticism to enjoy this show. DeGennaro puts just enough human touch in her mathematical forms. The pulsing rhythms of her dots feel like the sweet twinkling of stars. The painted dots reflect the artist’s skill as well as a meditative evenness akin to counting rosary beads or spinning a prayer wheel. DeGennaro also has a few tricks up her sleeve that she uses to wonderful effect: her circles of dots are based in pairs (blue/orange, red/white, etc.) but she mixes in enough other colors to make you look at each. This both draws you in to the painting and lets you set the rhythm of your own gaze. 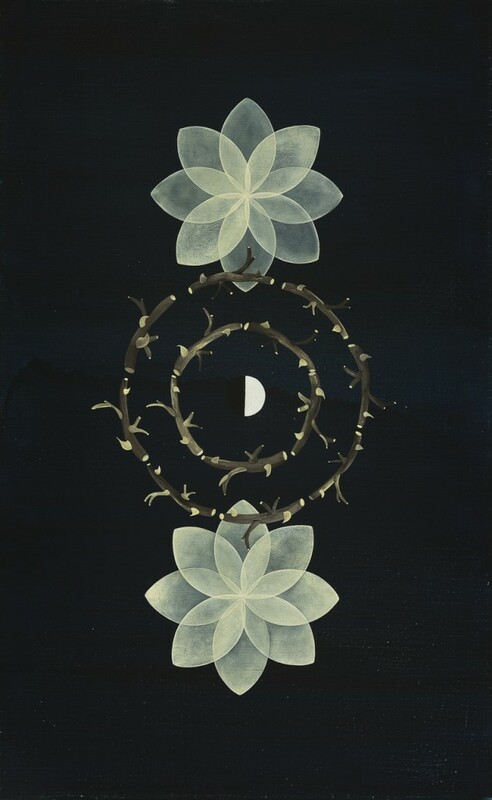 My favorite piece (“Blueprint”) features two of the lotus/vesica piscis forms — one above the other — on the indigo/black ground. Over the two forms is a trio of concentric circles made of black and creamy white dots. Two of the dots in the lower left are yellow; this not only adds a spark of dynamism to the insistently symmetrical painting, but also pulls the lighter dots into the yellow-to-blue range of the overlapping green ellipses. Like much of DeGennaro’s work, it is intensely calm and elegantly delicious. DeGennaro’s works on paper feel quite different than her oils on linen. To begin, the black paper is a smoother, richer and more even surface. The artist reveals the odd swoops of the linen intentionally by sanding their surfaces. While this plays up their presence as objects, the uneven lines of the linen are often at odds with the orientation of the painted forms. Also, the works on paper are of a squatter and more comfortable format. The ratio of height to width of a vesica piscis is the square root of three, and DeGennaro has approximated this with 34-inch by 21-inch canvases. This vertical proportion might have great posture, but it is more tense than the paper format. “Indigo” works as either a show of spiritual art or as geometrical abstraction. There is a bit of awkwardness in some of the more ornamental forms and their color schemes, and even a touch of literal overkill with “Crown of Thorns,” but DeGennaro’s work is smart and well-executed, and looks terrific in Aucocisco’s handsome space.